My colleague, Cheryl Hanback, is organizing the annual "Night Before The Day of Service Dinner." This has been annual event since the conference in Orlando back in 2002. Curious about the Day of Service, you can read more here. And, if you still haven't picked your day of service project, there are still a few more to choose from. 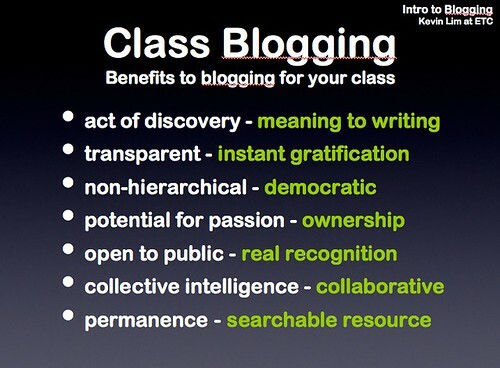 That we will address during the session on Nonprofit Blogging at the NTC Conference in Seattle next month. The panelists are John Lorance from CompuMentor, Nancy White from Full Circle, and Marshall Kirkpatrick. I came across a post from Kevin Lim who writes about social technology and recently posted some information from his Intro to Blogs Workshop. His focus not on the writing process, but the importance of reading blogs and knowing what's going on out there. He includes an excellent resource list in his post - I like the references to the "soft side of blogging," especially "Why Web Blog?" and Dave Pollard's "The Blogging Process." Will you be at NTC in Seattle? Will you be in town on the evening of Wednesday, March 22nd? Are you involved with NET2 or want to learn more? Interested in connecting with other NTC conference attendees for dinner at a Seattle landmark and talk about using new web tools for social change? Wednesday, March 22nd at 8:30 p.m. If you want to join us, RSVP at upcoming. The restaurant is a short walk from the Westin Hotel (conference site). If you don't want to walk, you can take the 16 bus. Wow, what a busy day that will be! I'll be finishing up the Day of Service and will enjoy Science Fair before heading out an informal gathering taking place ONE/Northwest's Office. Who can resist an invitation for an informal hang out at their scenic office space to watch the sunset over Elliot Bay? (Drinks and snacks, too). RSVP is here. I'm gonna walk over to Ivar's from Jon Stahl's office which is about a half-mile away. Otherwise, meet up with us at the restaurant. Exactly six years ago today, we traveled half-way around the world and Harry was placed on our arms. So, every year we celebrate the day and for dessert Harry gets to order whatever he wants without parent protest. This year he wanted three flavors of ice cream (mint chip, chocolate, and vanilla). The traditional bedtime story on this day is to look at the photo album for our trip. We also do the same for Sara on her "Gotcha" day which is September 30th. Have you ever eaten dried mangos from the Phillippines? They are addicting. My children prefer dried mangos over lollypops, and gasp, chocolate. And, they have lots of vitamin c.
Good Luck at Net Tuesday Seth! The other speaker is Mena Trott from Six Apart - the company behind Typepad, Moveable Type, and Live Journal. I wish I could be there, but being in on the East Coast makes that impossible. Although, I hope to catch the podcast. Yesterday, Seth emailed me for some advice on his presentation. I offered to listen to him present (on the other end of the phone). He did a great job in rehearsal and I'm sure it will be a big hit! This article by Robin Good showed up as new in my aggregator, although it was written in September, 2005. I'm glad because I didn't see in September and it may be useful to include as a reference for the NTC Conference Blogging Panel. Good points to a master's thesis on the Social Phenomenon of Blogs by James Torio. Nonetheless the big fuss many of the early adopters of blog technology have made of their newly acquired communication potential, only a handful of them have fully understood and leveraged the opportunities offered to them by the new medium. What bloggers have yet failed to achieve in full, is having been able to clearly communicate and explain the power that these tools offer to the non-technical person. The immense opportunity yet untapped by our many brothers and sisters who while having a sharp mind and desire to have an impact by communicating to others their ideas are still stuck in sending emails to their network of contacts." We got around 18 inches of snow from the blizzard this past weekend. I didn't get any good shots, but looks like Joe Baker of N-TEN did. 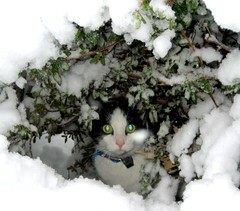 I love this one of "Jake" - the green eyes are just amazing. Speaking of N-TEN and cat blogging, Nancy White, Marshall Kirkpatrick, and John Lorance did a panel planning on wiki. 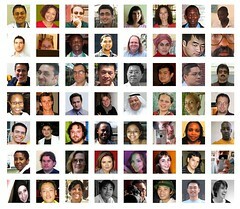 These are the all the authors (who provided a photo) for Global s top page. I'm proud to be part of the 56! The photo is from Boris Anthony's flickr stream. Hat tip to Ethan Zuckerman. A few years ago when I was working for the Online Arts Leadership project with the New York State Alliance for Arts Organizations and Cornell University, I met Julia Fabris McBride. At the time, she was deputy director for programming at the Illinois Arts Alliance Foundation (IAAF). She has since started her own consultanting company, Community Collaborations. I have not heard from her in a while, but she just sent an email telling me aobut her new blog. In March 2006 Julia and her husband, architect William A. McBride will make their long-anticipated move to Matfield Green, a town of 70 people in the heart of Flint Hills of Kansas. That was the title of Julie Leung's session at Northern (Canada's blogging conference). I wasn't there, but managed to find Alan Levine's post of a summary. I was hoping to find some detailed notes that would provide some how tos for bloggers. Alas, not much. But Alan points to Julie's delicious storytelling tag stream. I'm interested because this point is one that I cover in the N-TEN Webinar and was curious about other resources. 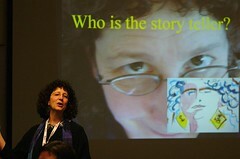 Update: Nancy reports that she didn't wear the purple PJs and here PPT slides can be found here. There was a tip in the comments on how to compress PPT slides. 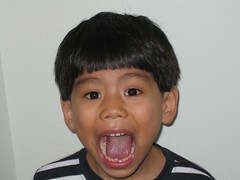 When Harry's first tooth came out, we made a cross-cultural remix vlog post with help from Cambodian Bloggers. Harry's second baby tooth came out! Now he's waiting for another dollar and a riel (apparently the Tooth Fairy gives out US and Cambodian currency in this house). He is also waiting for another letter from the Tooth Fairy, Inc (aka pop pop). The Tooth Fairy sent him a poem after he lost his first tooth. Leaves you going from twenty to twenty four. I've been listening to a sound file that Alan Levine captured of Nancy White's session on the Seven Competencies of Online Interaction. Global learners do a better in the online world than sequential learners. Reference from Richard M. Felder and Barbara A. Soloman "Learning Styles and Strategies." Alexandra Samuels is live blogging from NetSquared North, a gathering of folks interested in non-profit technology issues who are in town for the Northern blogging conference. There is also a wiki. 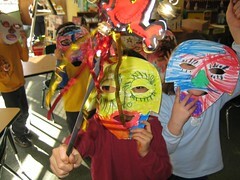 Today I visited both Harry's and Sara's schools and did a lesson on the Lunar/Chinese New Year which ends this weekend. Sara's school does not have an Internet-connected computer, so the activities were focused on movement, reading a book about it, circle time, doing related crafts, and singing a song. They made "Year of the Dog" New Year's cards and good luck scrolls. I used photoshop and word to create templates and "stickers" on address labels for them to use. They really enjoyed the "Gung Hay Fat Choy" song. Before I introduced the song, in the circle time we practiced saying Happy New Year in Chinese. (I told the kids that if they say that in Chinese restaurant to the waiter, it will make the waiter happy and they might even get a second fortune cookie.) Then I played the song and had them raise their hand when they heard the phrase. Next we sang the song together - mostly the chorus. And for each verse, we made up hand movements to match the words. The song has a nice relaxing tune. If I were to do this lesson again, I'd put the song at the end before the snack. The crafts were a big hit. With two crafts stations set up, and so many kids, I was so busy I didn't remember to take out my digital camera until the end. At Harry's class, I did the circle time of explaining Chinese New Year -- mostly as an inquiry lecture - asking them lots of questions and encouraging their questions. I also showed them examples. Each kid got a red envelope with Buddhist Prayer Money. I told them that after circle we would use SKYPE internet phone to call Nick in Hong Kong. These six-year olds were amazed that we could do that with a computer and very impressed that I knew someone in Hong Kong. I explained to them that my computer was turned into a phone and showed on the globe where Hong Kong was. I told them Nick could answer the questions they had about the flickr photo set he put together. The day before, I had worked with the school's IT Director to get access to their wireless network and get ports cleared so we could I jack in my laptop and get beyond the firewall. I was not able to get on with my laptop. While IT director went back to her office and grabbed her laptop loaded with SKYPE, Harry's teacher and I asked the kids to brainstorm a list of questions they wanted to ask Nick. What time do Asian people go to bed on Chinese New Year? How did the animals know what the emperor ("god") was saying to them when he suggested having a race to name the animal zodiac? Was there really a dragon named Nien-- or is that just a story? Why did the emperor decide to have a race? What other animals besides the cat didn't win and why? When Nieth the Dragon sees the color red, why is he so afraid? Did Nieth think the red color was blood? Why were the villagers so scared of the dragon if dragons aren't real? Could they have been afraid of something else? Is the dragon smart or stupid because he was afraid of firecrackers and loud noise? What kind of food do people eat for Chinese New Year? What is the food in the first flickr photo? Is something sweet? It looks yucky. Is hard is it to learn how to write Gung Hay Fat Choy? via Johanna Bates, nonprofit technology geek extraordinaire who works for Community Partners send me this update about a project that her husband, Colin Mitchell, just helped launch. personal fave so far... "Kitty and Choke" (very short, make sure your sound is on). There's some truly funny, creative, brilliant pieces here already, and more coming in all the time. Enjoy!" I just clicked over there and I'm still laughing ... it makes me want to get back in the vlog thing again ... look out. 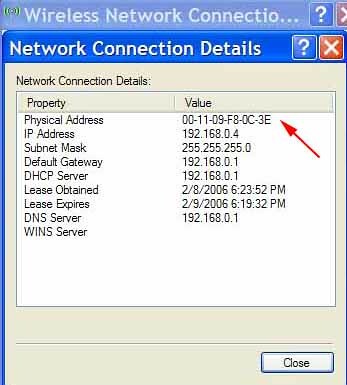 Wireless Networking Card Mac Address? Help! On Friday, I'm doing Chinese New Year lessons at Harry's and Sara's respective classrooms on Friday. At Harry's school, there is an Internet-connected computer, MAC. I didn't want to mess with installing (and unstalling) SKYPE on the computer so I could call Nick in Hong Kong as we view his flickr photo set and he could answer questions. So, contacted the IT person and found out that I needed to show that my laptop had uptodate virus software and definitions on it as well as malware (it does) and get her the MAC address by tommorrow. I know just enough about the hardware to be dangerous. I found the screen that gave me the properties of wireless networking card connection and there is a physical address. Is that the MAC address? If not, can anyone tell me where the F* to find it on Windows XP? EVDO is a technical advance about getting major internet connection anywhere you cell works. So it means you can blog on the road without trying to pretend you are happy using a phone to type. For those online junkies like me - this is great. Europe has had this availability for awhile so it was only a matter of time that it showed up here. We don’t have it yet but I suspect Marc will be buying it soon. connections and web-based enrollment program to increase the speed and accuracy of the process. You can learn a lot from presentation coaches and communication books, but this is not rocket science. We can be much better by simply looking at the presentation as an opportunity to have a conversation with others about something we care about. All the technique, training, and "PowerPoint" tricks are useless if the talk doesn't come from your gut, from your heart and soul. His personal web site has some good tips on creating, delivering, and slide design. I love his tips and he shares his creation process too ... it's definitely how I begin and create and it's in "analog mode." Reynolds notes "Though you may be using digital technology when you deliver your presentation, the act of speaking and connecting to an audience — to persuade, sell, or inform — is very much analog." My process is analog, but I have to start with a mind map of the ideas (sometimes several versions of it), then do a linear outline, and finally sketch out a storyboard with image ideas. Then I sit with my storyboard, and look through my photo sources, like flickr and my photographs. Then, I start to develop it in Powerpoint and I don't touch the templates at all ... I create from scratch to give it consistent visual look, but avoid the cookier cutter asethetics. Reynolds advises using color well because it evokes feelings and emotions. Spoken as a true artist he writes, "The right color can help persuade and motivate. Studies show that color usuage can increase interest and improve learning comprehension and retention." His tips off a quick lesson in color theory and some pointers to other resources, including an article on how to tweak the color schemes in Powerpoint. I'm preparing for a Webinar I'm doing next week and am revising some of the materials and exercises based on my experience delivering it for the first time. I'm also a learner right now in some online workshop and one of the best teachers I've encountered in a long while just said something that I'd like write on a post-it note to keep in view or frame to hang on my wall. "I am comfortable sharing my mistakes as a learning moment. It is much better than just sitting silently feeling bad about them!" Many of us think that as the "teacher" we have a model a perfect process! After all, we're the suppose to be the expert, right? However, think about some of your best learning. Was it when everything worked correctly and as expected or was when something went wrong .... really wrong. My most memorable learning experiences as a teacher are when things were going along just swimmingly -- just as I had anticipated and then Wham! something unexpected happened. work and that is often as or more effective than showing how it does work. Anyone who has done any teaching in a computer lab has probably had this experience. You know, where you show the steps, but when the students try to do it, they make a mistake or go off track in a way that you weren't anticipating. Sometimes you can hear adult students muttering "WTF" to the computer, perhaps why some have dubbed this the "WTF learning principle"). The inspiring trainer of trainers are those who model how mistakes can be teachable moments. I "met" Andy Roberts via CP2 web2.0 online workshop - which was fantastic. His reflections remind me that I wish I could have immerse myself in the entire content (which was enormous) for the entire month, but those exercises and discussion that I managed to swoop into provided me with significant learning. Particularly the tagging discussion which included an action learning exercise as well as lot of sharing of resources and information about tagging. It also reminded me that I haven't posted my own reflection. The exercise went something like this and it struck me that if I ever taught a workshop on how to use tagging that I would definitely do something like this, tailored to the group's interests of course. Think of at least three people who have influenced you the most in your work in communities of practice. 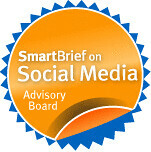 Go to del.icio.us, a social bookmarking or tagging tool, and create an account (if you don't already have one). Go to a link or resource that you most associate with each of your influential people and post and tag the link in your my del.icio.us. We ask you to use at least 4 tags (preferably 6 or so) one of of which must be "CoP+maven" (chosen as an already blank tag set). In your my del.icio.us page explore out to see where and to whom your tag links take you. Come back later, give the system time to update, and spend a brief time exploring the search aspects of your tags, others linked tags and the common tags. Do a search on our prescribed tag CoP+maven or use this URL http://del.icio.us/tag/"CoP+maven"
When finished return here and reflect on your experience. Let's see where this shared task leads us! Is popularity (frequency of the number of people who bookmark a link) an indication of quality? Is using more tags beneficial to finding or sharing or a hindrance? Did I discover resources that I would not have discovered if I did a google search on COP or communities of practice experts and all the combinations there of? Do you have to be disciplined and structured in your search methods/approach to reap benefits from Delicious or is a non-linear approach useful - or does it depend on the user? How can keep from getting so distracted with this tool! Does having more tags help you find something faster or does it get in the way? The one aspect of delicious that frustrates me is when I find another user whose bookmarks are of great interest to me, I want to know more about them. Many times only userids are given, not their blogs or affiliations. 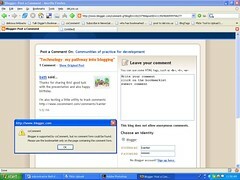 1) The story about community developing around the nptech tag. I got excited when I read this post on Nancy White's blog about comment tracking tool called CoComment via a post by Scoble. I was excited because the other way to do this is to bookmark your comments in delicious with a tag like comments and use the feed to display them on your sidebar. It was an invitation only thing, but I signed up for notification and before you know it I got an email invitation with a code. So, I registered. I was able to install and configure the little sidebar box using the code. Then off to bookmark some comments. Okay, there is a greasemonkey script so you can skip the clicking on the bookmarklet. So, when off to comment on some blogs to give this a test ride. I left comments on two blogger blogs and got this annoying error message. I event went back and reread the directions and did it slowly and still got the same error. So, either too many people are playing with it right now or it doesn't work like it says. The donorpowerblog asks and answers "Should your nonprofit blog?" The post begins with some points to nonprofit blogging advocates, including a well thought out article called "Why Non-profits Should Blog"
This is followed by the "Reasons Why You Should Do It Anyway"
1. It's here to stay, start now, and you'll be an old hand by the time it happens. Experience is valuable. What are your ideas about the pros and cons of blogging for nonprofits?